Boxcutters, Jigger, Shaker Classic/Boston, Citrus Juicer, Strainer, Saucers, Martini Glass. Add all ingredients to cocktail shaker. Shake vigorously. 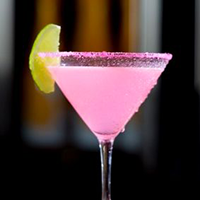 Pour into a martini glass that has a hot pink sugar rim. Taste for balance and garnish with a lime wedge.